But for me I've found that if I really want to get anything done, and if I want to do it with any degree of excellence, I need to get dressed. I'm all for the occasional pj day, but for the most part I shower, put on a pair of nice jeans, shorts or cropped pants and a nice shirt, squirt on some perfume (so my dogs think I smell sweet! ), apply my make-up, and put on my jewelry. That way when I sit down to my computer to write I feel all professional and such! You think I'm crazy, but it makes a difference. Before I started doing so much "work" during the day - writing, mentoring, and such - and was just taking care of preschoolers and cleaning toilets (I still clean the toilets, by the way), I still got dressed. I found it just made a difference in the way I related to my kids, how I scheduled my day, what I accomplished in my home, and how I viewed myself. I may not have gone as far as to put on make-up before noon, but I tried to make sure I had the cheerios out of my hair and my shirt on right side out. It just made me feel better about myself and the work I had to do that day (more on that later). I'm writing this post today for a couple of reasons. First of all, I found this nifty little challenge at Like a Warm Cup of Coffee. 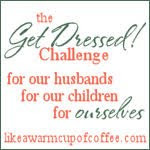 Sarah Mae is challenging all of us stay-at-home mom types to get dressed, for pete's sake...and for our husband's sake, our kids' sake, and our sake. I'm all with her on that. But I'm also writing this post because I just really believe in the benefits of being intentional about your day. If I'm not careful I can just drift through my day with no aim or purpose and end up on the back side of no where with absolutely nothing to show for it. I don't have the kind of job with a lot of built in structure, but I need to impose a little structure on myself if I want my day to amount to anything. I know a lot of my readers are either stay-at-home moms with preschoolers, moms whose kids have gone on to school but they still work in the home, work-from-home women with home-based businesses, homeschooling moms, retired folks, or full-time students. We're all home alone a lot and the temptation is to just let things go, things like our hair, our clothes, our time, that last load of laundry in the dryer. But when I do that I end up with a "let go" kind of attitude instead of a "get up and go" one. And before I know it the day has gotten up and gone and I've been left behind. Sometimes, as a woman who doesn't get up and go to a full-time job each morning where I punch a clock, report to a supervisor, complete a set agenda, and receive a paycheck, I struggle with feeling like what I do is even worthy of calling "work." I have no one to validate that I've put in my time, no one to evaluate my work, no one to sing my praises when I've turned a profit, and no one to glare at me when I try to leave work early. It's easy for me to drift into thinking that what I do doesn't really matter, so I how look (and smell) doesn't either. But when I take the time to get dressed for my day, I send my silly brain the message that what I do does indeed matter, that Someone is indeed watching me and evaluating my work, and that I'd better get busy and turn a profit - whether that profit is laundered clothes, cooked meals, well-loved and cared for children, a speaking gig, or a check for a published article. Colossians 3:23 says, "Whatever you do, do your work heartily, as for the Lord rather than for men." And Romans 12:11 reminds us not to lag behind in diligence, but to be fervent in spirit, using our time to serve the Lord. I don't mean to sound legalistic or works-oriented, but God puts a premium on hard work, an industrious spirit, steady labor, and diligence. He gives us each day as a gift and we are to use that day to accomplish the work He has given us. And even if my work is in or through or from my home, that work is valuable and worthy of my best efforts. In fact, many would say work done in the home is the most valuable of all, but that's a topic for another day. So hey, if you had already mapped out this day as a stay-in-my-pjs-and-take-a-break day, go for it. We all need one of those occasionally. But if you have work to do and you're wanting to accomplish something today, then get dressed for pete's sake ... or your sake. Act like someone who has a job to do, even if that job is folding clothes and vacuuming or running after toddlers. And at the end of the day you'll be able to look back on your day and know that you accomplished the work God had planned for you. 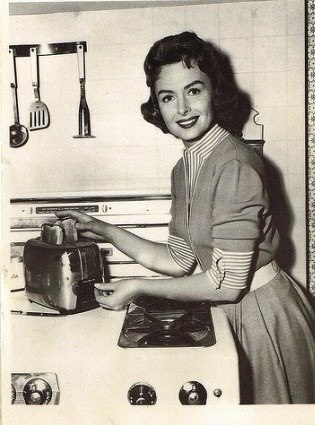 And I'll bet you did the job just a little bit better because you had some pants on... heels and pearls are optional. Blessings to you, my friends. Don't forget today's comments still count toward the prizes I'm offering for my 100th blog party! And by the way, that is exactly what this has felt like to me - a big party where we've all mingling and getting to know one another. It's been a treat and you've delighted me with your presence. Thank you for coming!